Patrick just did an analysis on the Miami Dolphins defensive front, so I am going to continue our series and take a look at the other side of the ball today. I am going to be taking a look at the offensive line, which was solid last year but nothing to speak of. Now what I'm going to do is take a look at each guy and who could potentially compete with them for the spot. Martin only played four games last season as a left tackle filling in for the injured Jake Long. He was not very impressive at that spot, but a large part of that is due to him being underweight. He claims that he has gained 15 pounds this offseason, which is an encouraging sign. All signs are pointing to him starting at left tackle this year. The guy who I could see as potential competition to Martin would be versatile rookie lineman Dallas Thomas. I am expecting Thomas to be the starting left guard, but Miami wants him to learn guard and tackle on the left side, so he could potentially beat out Martin for the job. Miami drafted Thomas out of Tennessee in the third round (77th overall) of this year's draft. Thomas is a very versatile offensive lineman. He is capable of playing tackle, but he is better suited to play guard. 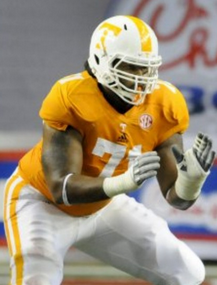 The Dolphins want him on the left side, and they have been working him at both tackle and guard. I expect Martin to take the left tackle job, though, so that leaves the guard spot for Thomas. Thomas, like Martin last year, is a little on the light side. He could stand to gain a little weight, and I fully expect that Miami will work on bulking him up this offseason. He is an excellent pass protector and should be able to block for Ryan Tannehill very nicely. His run blocking isn't quite as excellent, but he is still very good at it. Potential competition for Thomas would be Richie Incognito and John Jerry, depending on who doesn't win the right guard spot. 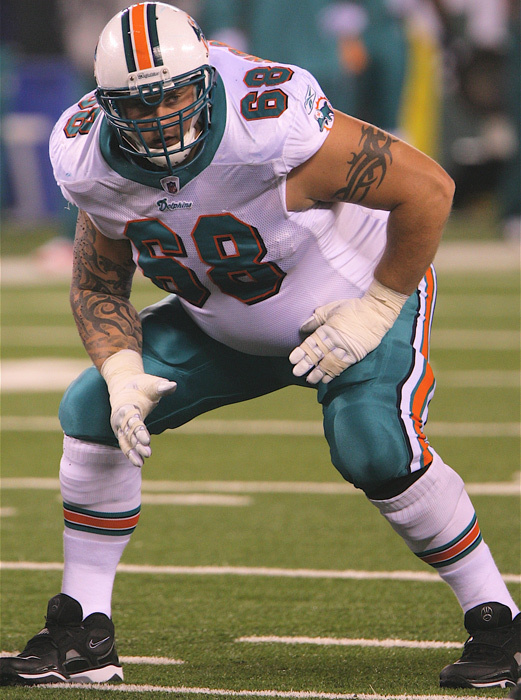 Incognito was the starting left guard for Miami last year, but the Dolphins desire to have Thomas on the left side makes me think that they'll move Incognito to the right. Jerry was the starter on the right side, and if he doesn't win the competition against Incognito then we could see him competing with Thomas on the left. Pouncey is 100% safe at center after last year's Pro Bowl-worthy season. He will be the starter and we can expect him to be an anchor on the offensive line. This is where it gets a little more interesting. John Jerry was Miami's starting right guard last season after he was finally able to get his weight under control, but Richie Incognito will probably be replaced by Dallas Thomas so he will be looking for a new job on the right side. I think that Incognito will be able to win out. Richie is an important part of the team and, in my opinion, is the better lineman, so it makes more sense to have him starting. Like I said above, whoever loses out on this job will likely be competing for the spot at left guard as well, but unfortunately for John Jerry, it looks like Incognito and Thomas will have the starting jobs at the start of the season. Jerry makes for excellent depth, though. Another possible competitor is Lance Louis from the Chicago Bears. Louis was awful as a tackle for the Bears, but he is a good guard. He will add competition to the line. The Dolphins needed another tackle, so after the draft they signed free agent veteran Tyson Clabo out of Atlanta. Clabo is a very solid all-around tackle who was cut from the Falcons for cap reasons. He is a little on the old side, though, at 31 years old, but he should fill in nicely and give Miami time to find a replacement in the next year or two. Like Pouncey, Clabo is pretty much a lock to be the starter. So there you have it. I am very optimistic about our offensive line this season. 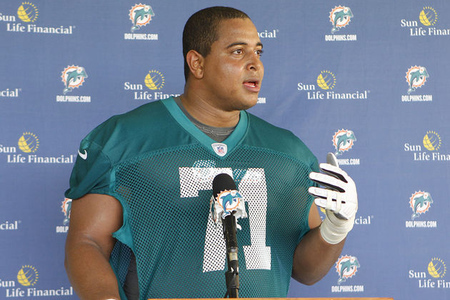 The biggest question mark is Jonathan Martin, but I have confidence that he will be able to play well. He will have had an offseason to bulk up, and he will be able to play on the left side from the start. Thanks for stopping by. What do you guys think about our offensive line? Let me know below. Email me at paul@dolphinshout.com. I'm also on twitter @PaulDSmythe.